Join us at the May 10th FEAST to support local artists and advocates! FEAST is a community dinner held quarterly, at which attendees pay to attend a catered reception, and a portion of that payment is set aside as a prize. While attendees eat, mingle, and imbibe, different artists showcase their work and explain their proposed public art project. After the presenters are finished, attendees vote on which artist's project they wish to award the prize. MAY 10TH FEAST THEME / CALL FOR ARTISTS: The May 10th FEAST event will be founded in advocacy. Three artists will present their ideas for 1) producing meaningful artwork that embodies a current challenge in their community, and 2) using proceeds from the FEAST event to shed more light on the community-issue through public programs and advocacy. 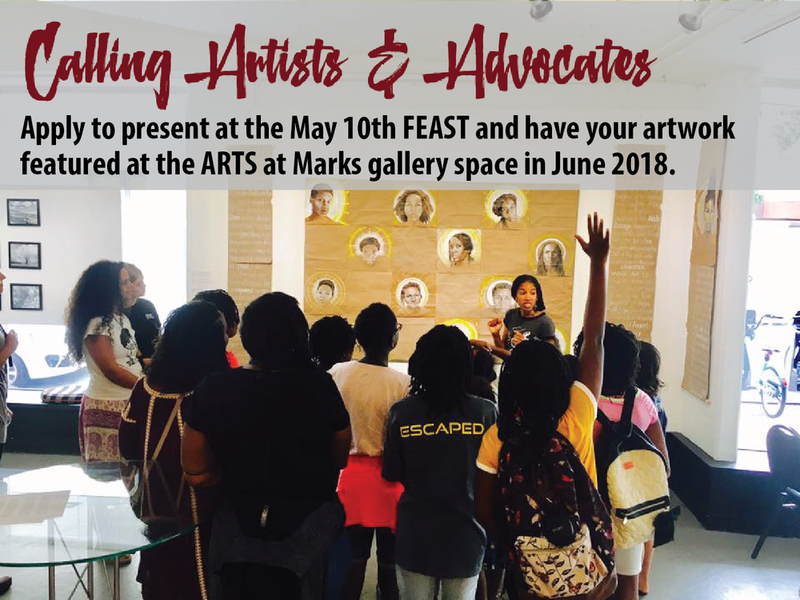 Click on the following link for details on presenting at FEAST and having your artwork featured at the ARTS at Marks gallery space in June 2018. SCHEDULE: Food and drinks will be available at 6pm. Presentations will begin at 6:30pm. ABOUT: Hawaiʻi FEAST is an event platform that supports place-based and public artwork through community financing and social networks. FEAST empowers artists to create a sense of place within their communities through creative expression. FEAST is built solely upon community resources; Local artists produce ideas for public artwork and community members take part in the decision making process of selecting projects and financing these projects.